J. Coughlan & Sons (notice JCS on uniform) baseball squad copped the 1918 Commercial Baseball League pennant in their first year of participation in that Vancouver circuit. 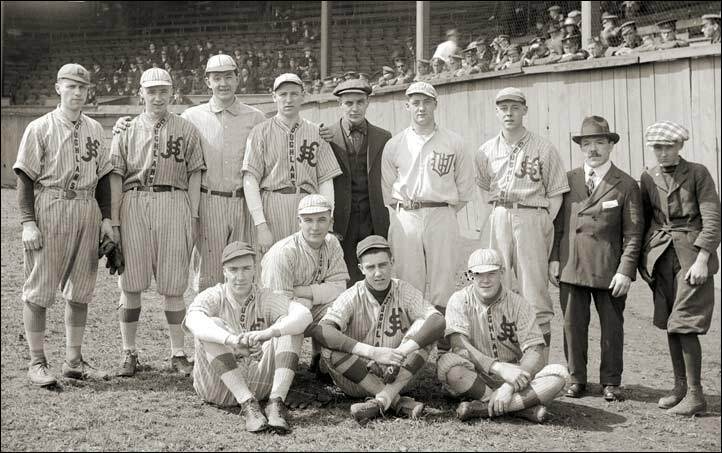 Photo taken before Commercial League Coughlan’s exhibition game vs Vancouver Beavers of the 1918 class B Pacific Coast International Baseball League on April 24, 1918. One player wearing a Beavers’ uniform appears in the pic (probably loaned out to Coughlan’s for the exhibition match). No known player ID’s No box score was printed for the game but the linescore shows T. Locheed, Durfee and Moran shared pitching duties for Coughlan’s while Rogers was behind the plate for the entire game. On that basis, it is fair to assume that the aforementioned four players are in the group pic.